Senator Scott Brown said he will accept a debate at the ­Edward M. Kennedy Institute but only on the condition that Vicki Kennedy stay neutral in the election and that MSNBC not be included as a broadcast partner. The Brown campaign said in a press release that it would agree to allow former NBC ­anchor Tom Brokaw to moderate. Elizabeth Warren has already accepted the Sept. 27 debate, but Brown had previously not committed. The candidates are jointly committed to two other televised debates so far, one in the Boston market and a second one in Western Massachusetts. 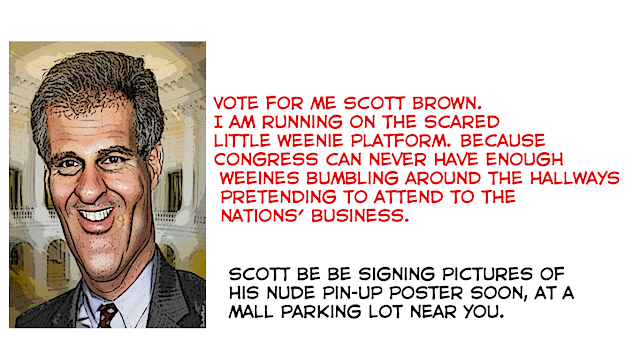 ....Brown has agreed to two ­radio debates, including one moderated by Dan Rea, a conservative-leaning talk show host, and another hosted by Margery Eagan, a Boston Herald columnist, and Jim Braude, a Democrat and former Cambridge city councilor. Brown is a afraid that at some point he will have to honestly answer some tough questions, instead of being tossed fuzz balls by spineless conservative puppets like Dan Rea. Once again brown is inadvertently sending the public a message about his character and courage - he admits he is a weenie, that he has plenty to hide and has no respect for the democratic process.